I’ve enjoyed a number of walks with friends over the past few weeks, and they’ve left me thinking about walking with others. There’s a myriad of walking groups across the UK. Thousands of us join with others to walk, ramble, hike, explore, derive. Our motivations and processes vary. Some are searching for a visceral experience or socialising, some for improved fitness. Others explore walking as an intellectual process, an artistic pursuit, an act of defiance. Walking for me is all of the above; the context continually changes the intent and the practice, and WHO we walk with impacts our experience completely. To be joined by thousands in a demonstration march cements resolve, invigorates solidarity, and creates energy and spectacle. There is power in walking. Walking alone or with one other is a more intimate, thoughtful process. The context may be different from that of a political march, but there is transformatitive power here too, if you allow it. Lee has been my walking companion for over a decade. We have enjoyed constant urban exploration: crawled through tunnels, found our way into abandoned buildings, devised urban walking games, used the streets to pursue our political convictions and to challenge ideas of trespass, become utterly, wonderfully lost in networks of alleyways, travelled to Vienna, London, Greece, Barcelona, just to walk their paths from dawn to dawn, and in so doing to truly know them. This is how we have found stories, and created our own. As we have moved our focus from the urban to the rural environment, we have learnt new things about the power of noise and the power of silence. We share conviction and motivation, and a slightly perverse love of challenging conditions. We walk well together. When the dynamic is changed by new walkers, the experience is transformed. This can prove to be surprising, joyous of frustrating, but always illuminating. One of our more regular companions is Paul. A practicing Buddhist, he shares my search (but not my motivation) for visceral experience, which leads to a sense of living in the moment. This is how I regain equilibrium. There’s a constant search for that moment my brain shuts up and the landscape rushes in to fill the space. Paul’s walking style is, on paper, in direct opposition to my own. He places importance on maps and destinations. He’s not enthusiastic about getting stuck in bogs. He likes to follow a route, and is perceptibly uncomfortable if we try to make him go off map. In practice, though it works. He’ll plan, and for those walks, we’re happy to follow. It’s a different way of engaging with the landscape for us, and allows us to think less about where were going and how the hell we’re going to get back, and just sit back to enjoy the ride. It’s a compromise, but also a chance to explore the landscape with someone we love, and it works. Walking on these occasions becomes about social bonding over shared experience, compromise and a bit of abusive banter, and that shared goal of going into the landscape and finding moments of perfect beauty and clarity, makes it work. 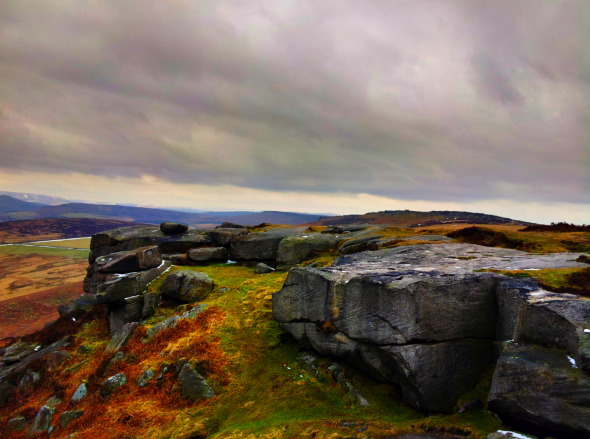 More recently, we were joined by friends Johnny and Angie, for a scramble over the sheer crags of Stanage Edge and up over the moors of the Hope Valley. This is a walk that I love. 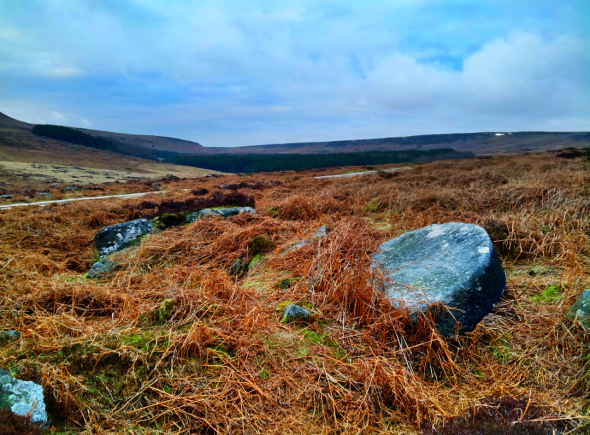 It is filled with short rock climbs, steep ascents up narrow ledged slopes, and finally opens up into wide moors with isolated hills rising above them. Here you can find the traces of bronze and Iron Age settlements, medieval thoroughfares, and incongruously, huge millstones that were once produced in the areas quarries, now left abandoned. It’s a popular spot, but still quiet on freezing February days. Angie and Johnny are both talkers. Together, they’re a verbal force to be reckoned with. They came along for fresh air and movement and bonding, but the lack of any silence was a challenge for me. While I enjoyed spending the day with much loved friends, I became more aware than ever that walking for me does encompass certain requirements, and that while I can compromise on process, as with Paul, if the shared goals are too different from my own, I return home feeling something was missing. My walking is about finding a discourse with the landscape. This walk became about enjoying friend’s company somewhere beautiful, and using the time for a lot of fun and talking. There are personal parameters that group walking can challenge or obliterate, and I had to shift my rigid expectations to accommodate the walking style of others. This has the potential to be challenging, but really rewarding. Our most recent walk was shared with Andrew, a friend whose love and wide knowledge of nature has its own transformative affect on walking. The three of us headed to the hill I grew up beneath: Pendle. 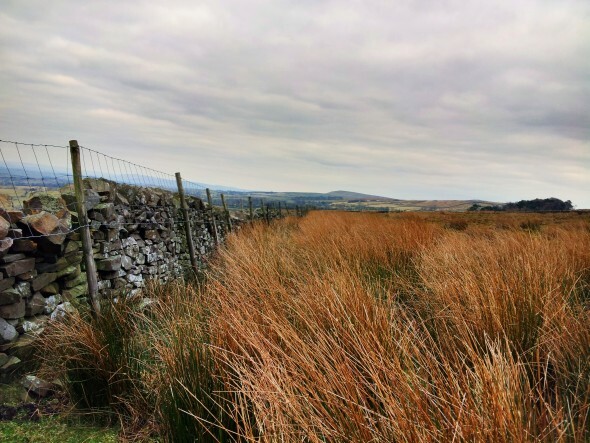 Pendle is a brooding, whale shaped mound that squats over the surrounding landscape; embroiled in local witch folklore and the all too real Pendle Witch Trials. Its name means “Hill Hill”, and as such locals avoid calling it Pendle Hill (Hill Hill Hill) and opt for just “Pendle”. We start from the Barley side, climbing quickly up through farm land to the base of the hill proper. Here, there are two possible routes, a steep climb up steps installed to help combat erosion, or a longer path that spans the side of the hill. We take the latter, and climb for 15 minutes to the summit trig. It’s a hazy day, and it’s difficult to see the woods and reservoirs that I know lie beneath us. This is an up and over. We slip and fall down the opposite, steeper side, covered in places with snow and thick, squelching peat trails. The vague destination is Downham for delicious hot chips from the tea room there. It’s a village preserved in amber: no road signs, satellite dishes or painted road lines are allowed in Downham; you step from the hills into the past. Along the way Andrew points out edible plants, good climbing trees, patches of snow we can still slide down, and defines bird species by their call or flight. His connection with the land is through a need to physically engage: climbing, tasting, running, swimming, playing – and wide knowledge of the plants and animals we share it with. It is both infectious and massively informative, offering new knowledge and experience. Full of chips, we return to the base of Pendle and head up to the summit for the second time that day. As we walk, we discuss our upcoming trip to Costa Rica; the walks we want to take, and the individual needs and parameters of the people we’ll be sharing them with. Andrew’s likely to do crazy, death defying climbs and swim in alligator filled rivers. His partner Phil is more cautious, and needs to define limits for us to respect. Lee and I are endurance walkers; we WANT to walk for miles in uncomfortable conditions; the others are less enthusiastic about trench foot. Between us, we share a common goal to explore, experience and create new narratives. The rest is just logistics.